Emphasizing the worth of positive customer interactions, Re-Inventing Your Contact Center provides tools for building the very best multi-channel customer relationship management system. Learn why customer contact centers are so valuable to the company’s bottom line. Discover how to keep employees motivated, challenged and committed. Understand the multiple channels used to communicate effectively with consumers. This new text unlocks many of the secrets behind successful customer service management and is filled with cases, exercises and assignments that build communication strategies, listening skills and confidence to re-invent one’s own contact center. Highlights multi-channel contact center strategies. Includes all forms of customer contact, such as: voice, email, fax, Web and more! Emphasizes the value of contact management centers. Discusses how customer service experiences impact consumer behavior and purchasing plans. 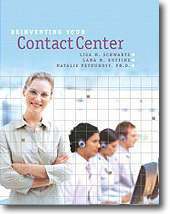 Includes numerous lists, charts, and calculations that can be used to determine contact center effectiveness. Excellent for anyone involved in managing a Contact Center. This book contains valuable information regarding the "people" side of technology initiatives. Many companies buy the best hardware and software, and spend thousands of dollars implementing technology only to find out that the employees resist the changes, and do not fully adopt the new, and possibly, improved processes. By understanding how to manage people during change, managers will see a much quicker ROI on their technology initiatives. A method to hire the right people for the right job and exceed your competitor's customer service, help desk, call center or contact center service. A process to calculate the ROI of "soft skills" and financially justify programs that decrease attrition and increase productivity and employee morale. The secret to using call center data (Forward Intelligence™) to increase profits, revenue, enhance Customer Life Time Value and gain an ROI via SP3M™.